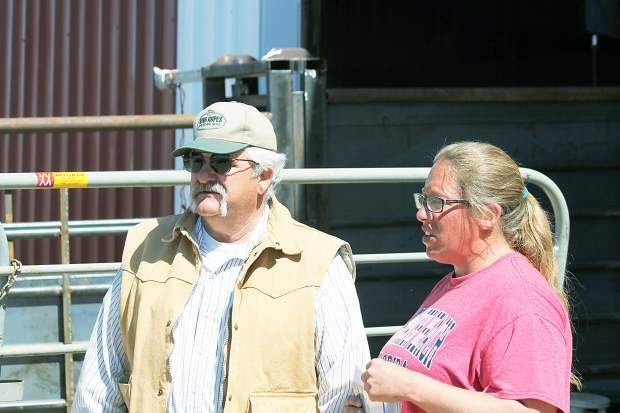 Kenny Schultz, Ekalaka, Montana and Amanda DeGrand looking over the DeGrand Angus bulls. 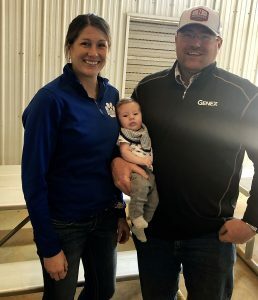 Art and Kathy DeGrand and family held the Annual DeGrand Angus bull sale at the Fallon County Fairgrounds on Apr. 17, 2015. The weather was perfect for a sale, bright and sunny with hardly a hint of wind. DeGrand Angus is a no-frills operation. The bulls are developed for longevity and soundness. They are run on mother’s milk and grass with out creep feed and are fed for moderate gains and not pushed. They are hard bodied, sound footed and will last for several breeding seasons. 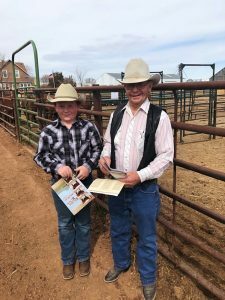 There were several large sire groups offered, giving buyers the chance to purchase half brothers in volume and a huge majority of the bulls in the sale would be suitable for use on heifers. The top selling bull was lot 13, DeGrand 4153 Total, a Mar. 2014 son of TC Total 8107 that had a weaning ratio of 108 and epds of BW 2.5 WW 57 Milk 26 YW 86. 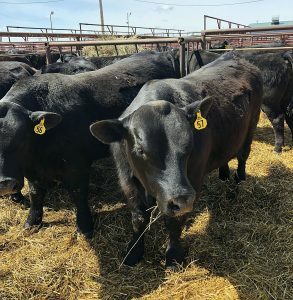 Repeat buyer, Lucky & Angus, Riverton, Wyoming was the buyer at $12,500. Lot 22, DeGrand 4137 Imminent, a Mar. 2014 so of S Imminent 1467 with epds of BW 0.6 WW 51 Milk 31 YW 87 sold to Kenny Schultz, Ekalaka, Montana for $11,000. Selling for $9,500 was lot 5, DeGrand 4209 Final Answer, a late March 2014 son of SAV Final Answer with epds of BW 0.3 WW 53 Milk 24 YW 91. 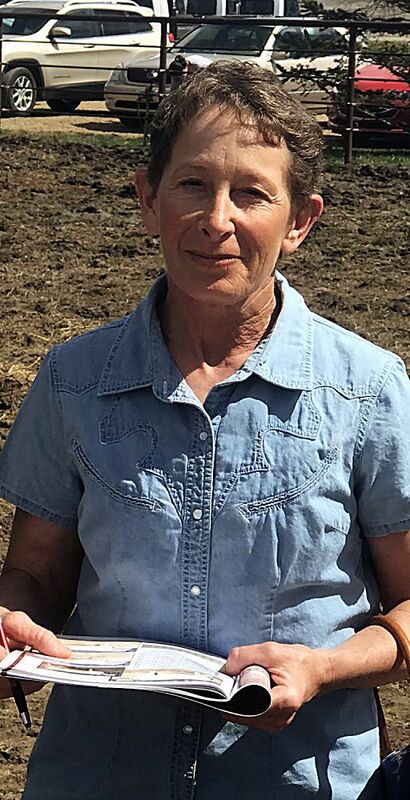 Harmon Creek Ranch, Ekalaka, Montana was the buyer. Also selling for $9,500 lot 6, DeGrand 4051, another Mar. 2014 son of Final Answer with epds of BW 1.9 WW 65 Milk 24 YW 104. This bull sold to Troy and Vicki Tope, Hulett, Wyoming. Lot 4, DeGrand 4019, also a Final Answer son, born Feb. 2014 sold to Don Polich, Forsyth, Montana at $9250. This bull has epds of BW -1.6 WW 61 Milk 24 YW 104. DeGrand Angus is supported by many repeat customers that know these bulls will work. Another thing that needs to be mentioned is the disposition of the bulls. At virtually every sale I attend you can be assured there will be some that act up in the ring. Art is very selective on herd sires that are known to be docile and has a great crew out back that don’t get the bulls worked up. 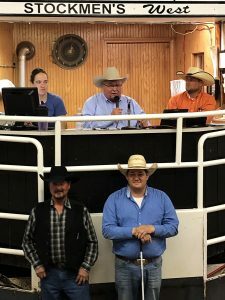 I don’t think there was a single bull that acted up in the sale ring.